One of the final steps in the porch or deck design process is picking out colors. Color means the least in terms of how well a design functions, but can have a huge emotional impact on how you respond to the project. You know from your own experience that the colors around you affect how you feel. Your color preferences may impact your choice of materials. While most of the synthetic lumber lines take their color cues from natural woods, from a practical perspective, there are many more choices available in composite decking than there are in real life. Color is also more consistent and predictable when you order it from our stock of samples. These products are also less likely to change and fade significantly over time. TimberTech legacy deck in mocha. Patio compliments deck and house trim. When people ask me for guidance on choosing colors, I often recommend tying into a dominant color from one or more of the surrounding structures. If you are building a deck adjoining the house, consider matching a trim color. If you are trying to bring together a deck, paver patio and home together, settle first on a family of colors– warm earth tones for example. Narrowing the choices down that way makes your ultimate selections easier. This photo shows pavers echoing roof and picture frame pavers matching deck in Timbertech Legacy Mocha. Some people like to stay with classic, timeless colors. You can never go wrong there. Oak and Walnut, both medium browns, are timeless choices. I can bring a variety of samples to your home and we can look at them out in the sunlight. If you are still concerned about color choice, we would be happy to send you to see different projects in colors you like so that you can see how they look on a large scale. One color caution I would offer is to not try and exactly match wood or paver colors directly with the facade of your home. Go with a contrasting or complementary color. Even if the colors match perfectly today, it is unlikely that the deck and the home will weather and age in exactly the same way. 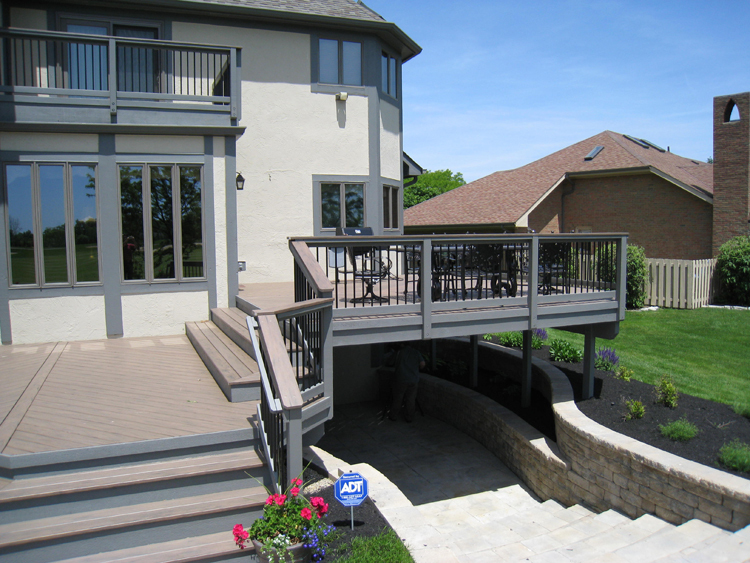 We want to help you build a deck you will love for a lifetime. If you’re thinking about adding an outdoor living space to your Columbus backyard, give us a call to see how we can make creating your dream backyard an enjoyable experience, start to finish. The consultation is completely free. 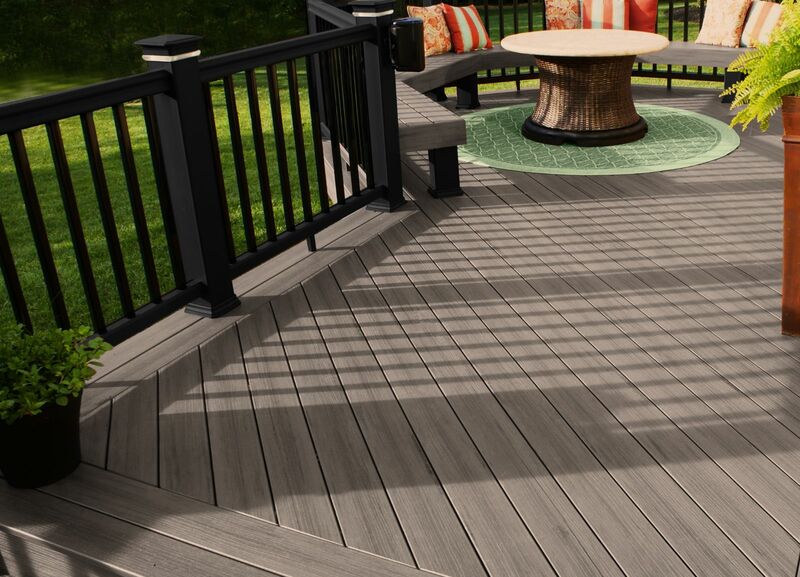 Composite decking materials just keep getting better and better. The newest offering from the decking board industry is a fabulous product called TimberTech Earthwood Evolutions Legacy. It gives its owners the beauty of hand-crafted hardwood indoor flooring in a product that is designed for outdoor living spaces. It’s incredibly durable and has a 25-year fade and stain warranty. It is available in Mocha, Pecan and Tigerwood and can be ordered with a grooved or square shouldered profile. We can install it with color-matched screws or no visible screws when we use TimberTech’s proprietary hidden fasteners. would have the opportunity to use it soon. 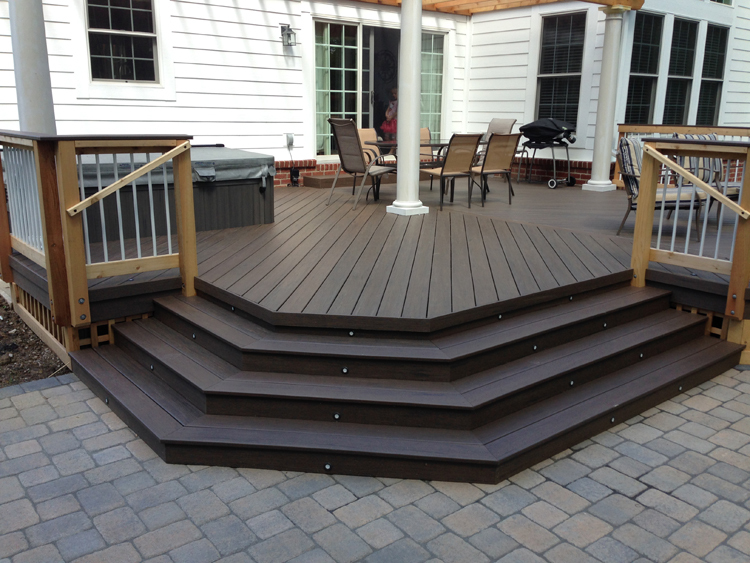 Our clients chose the darkest of the family of three tropical decking colors. Their house is white aluminum and we were anxious to see how the contrast would work–hint–it worked beautifully. The owners had a large existing patio that was not build correctly and was, as a result, unsafe. They found Archadeck after looking for a Columbus TimberTech deck builder. They also wanted to purchase and integrate a new hot tub into their deck. We knew this was an opportunity to create a unique Columbus deck design that would give them terrific flexibility in how they use their yard every day and, more importantly, eliminate a safety hazard from their home. The new deck isn’t large– about 475 square feet, but it has a huge impact on the look of the house and how the family uses their yard for relaxing and entertaining. 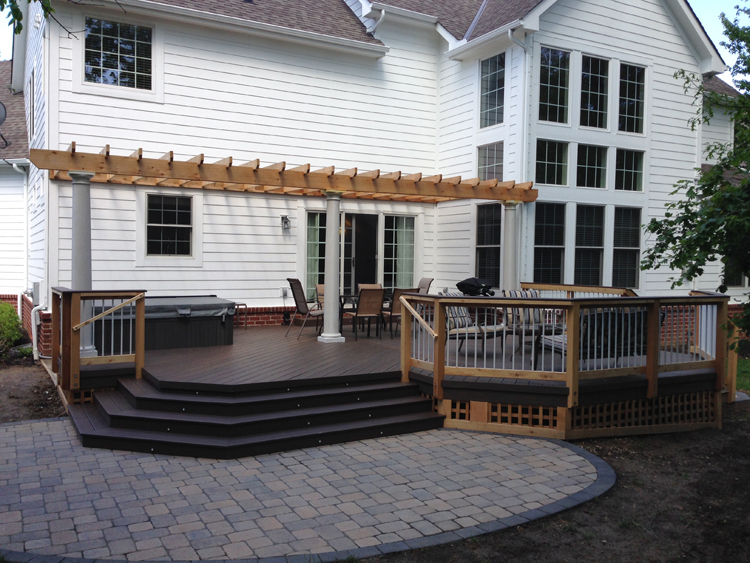 The TimberTech Mocha floor is surrounded by cedar railings with white aluminum pickets and matching mocha rail caps. We built a shady cedar pergola over a portion of the deck. The homeowner plans to stain all the cedar white to match the house. An LED-lighted inset bayed staircase naturally flows onto the stone patio. The completed project features three distinctive outdoor living areas with a variety of views and uses. There is a fire pit and dining area in one section that allows for easy monitoring of the kids on the playset. The area under the pergola offers a little extra privacy when using the hot tub. The patio pavers are Unilock Camelot. The whole project from the cedar lattice skirting to the grand staircase look elegant and high maintenance, but are really very easy to care for. Everyone was thrilled with the beauty of the TimberTech decking.